« A “3-2-1 Contact” Moment! 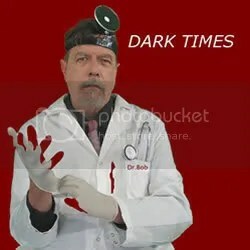 I was originally considering a “two-for-one” review covering the Edgetone Records release from Dr. Bob, “Dark Times;” as well as the Eddie the Rat release I posted yesterday. But when I thought about it more, I realized that I don’t really enjoy reading those sorts of reviews– they generally spend a long time on one artist, and not much on the others. Beside, these two albums couldn’t be much more different if they’d originated on separate planets. But hey, that’s why experimental music is so much fun. While I arrange the next few sentences in Schrodinger fashion, consider this term: “zone of transition.” This is the area in a store where shoppers are still in the frame of mind that they’re entering the store. It’s where you get into the shopping mode, and retailers try to make it as small as possible. Seeing as how cellist Bob Marsh and lap steel player David Michalak intend to steal listeners away on a strikingly unnatural carpet ride across the boundary where “paranoid” turns into “they’re watching you,” it’s a nice idea that the first track of this disc does very little aside from set the mood. “Dark times,” chants a creepy, electronically-mangled voice, “dark times!” No kidding. My first thought, truthfully, is that dark times were upon Marsh’s cello. I know he plays one– it’s listed in the liner notes. But amidst the scraping, bonking, wailing, and electronic car noises (pretty sure these are the lap steel, mostly) I can’t tell what awful calamity is befalling this helpless instrument. That’s not to say I don’t like it! This is some seriously creepy music, and both Marsh and Michalak go to some serious exploratory lengths to make it that way. I was especially impressed with Michalak’s choices to set aside the lap steel’s distinctive slides and swoops, occasionally generating pops and blurps of notes. Until now, I hadn’t heard a lot of improvisational work done with the instrument, so this was a lot of fun to hear. This is a fully-realized album that completely immerses listeners in one of those frightening worlds that have historically been a relief to escape from when the fictional journey is at an end. Anymore, though, it’s a bit hard to tell. I don’t think we’re quite there yet, but this could very well be the soundtrack ten years down the line. Caution! Dark times ahead. 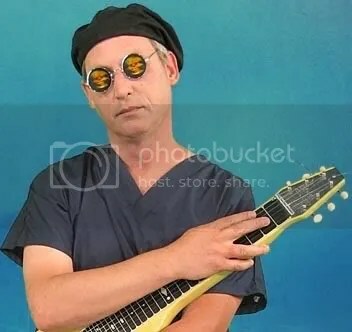 This entry was posted on February 7, 2007 at 10:18 pm and is filed under avant-garde, experimental, experimental music, music review. You can follow any responses to this entry through the RSS 2.0 feed. You can leave a response, or trackback from your own site.